How do I Import my Current Google Events into PracticePanther? Import your current Google events into PracticePanther. If for any reason you want to bring your current events from Google into your PracticePanther calendar, you will be able to do so by watching the video below or following these simple steps. 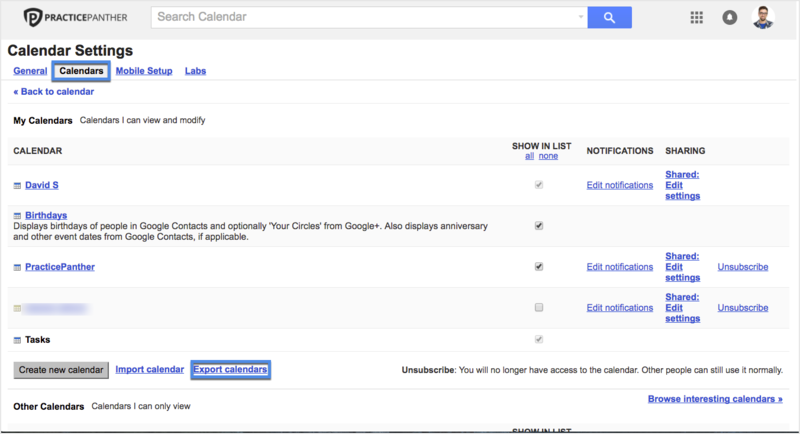 1) In Google calendar, click on the gear on the top right and click "Settings". 2) Click on the "Calendars" tab on the top and then click "Export calendars" found under your list of calendars. 3) In the "Downloads" folder on your computer, right click on the iCal Zip Folder created from the export. If you use Mac, click "Open", and if you use PC, click "Extract Here". A new regular folder with the same name will appear. 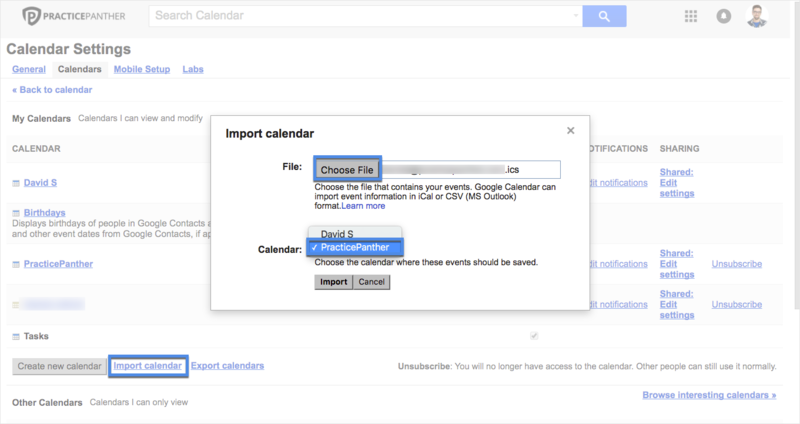 4) Back in the Google calendar settings page, click "Import Calendar". Then click "Choose File" and select your personal calendar located within the previously extracted folder in the picture above. Important: Make sure to select the "PracticePanther" calendar as the location for the events to be saved, and click "Import". Your events will be placed on the PracticePanther calendar. The next time the calendar syncs (within about an hour), you'll begin to see the events pour into PracticePanther over time. The activities page is the best place to track the progress of this event import. If you need any assistance with this calendar import, feel free to contact our support team any time!